Anne Cox lives and works in Tenants Harbor where, along with co-owner Julie Wortman, she maintains Hedgerow www.hedgerowdesign.com, a perennial and landscape design garden business. Cox has a Masters of Landscape Architecture from the University of Michigan and has been designing, installing and maintaining gardens and landscapes in midcoast Maine since 1997. She also makes imaginative rustic furniture. 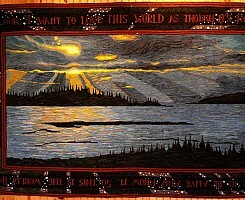 In 2006, Julie traveled to Nova Scotia and met rug hooking notable Deanne Fitzpatrick. She purchased a hooking kit with supplies to get started, but it was Anne who found interest in the kit. Ever since, during the cold winters in Maine and when the gardens sleep, Anne has been hooking. 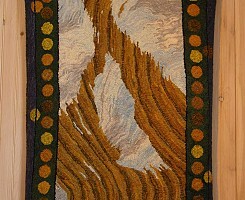 Her themes involve polypods, hay bales, sunrises and sunsets, and the beauty of the Maine landscape. 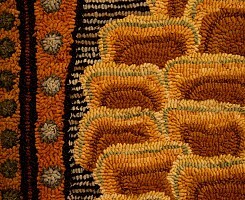 Her large piece "Look," a work that measures almost eight feet across, won the 2012 Viewers' Choice Award at the Green Mountain Rug Hooking Guild Show at Shelburne Museum in Vermont. 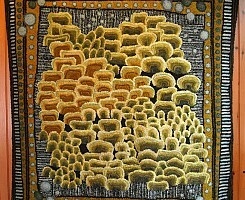 Cox creates her own designs and dyes most of the wool herself. The twelve works on view at Maine Fiberarts represent work completed in just three winters. Her talk on April 7 will offer insights into her design process and is sure to be of special interest to rug hookers, enthusiasts and collectors. Maine Fiberarts will also host a Hook-In on Friday, April 12, from 10 a.m.-2 p.m. Members of the Midcoast Rug Hookers, members of Maine Fiberarts, and others will be on hand demonstrating this traditional handcraft, and members of the public are invited to see this display. 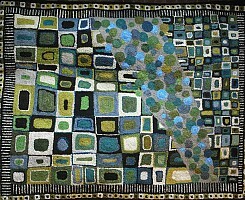 Inspired by Deanne Fitzpatrick’s marvelous rugs, I started hooking in 2006. And now I am eager for the winter months, which is when I spend time working on my rugs. The rest of the year I am busy with landscape and garden design, tending our market garden, and running a small nursery. I like a lot of things about rug hooking. I like the practical aspect of what I do: I am making things that can be used to warm up a floor or be a table runner, for instance. I like how slow the process is: I am forced to slow down as I cut the strips of wool and pull each one through the backing. As a result I think the rugs are very different from the way I might paint or draw the same images. I like the surprises that come when a shape gets smushed and rearranged by the loops next to them, rounding and flattening edges and corners. I like playing with color. My process is this. Usually. Often during the summer months I cogitate on images I would like to hook. So for instance, the body of the Larch rug was based on a Fall trip we took to Burlington Vermont when the hillsides along Rt. 2 were covered with the amazing colors of the larch needles and the border was based on the spring cones that look almost like raspberries waiting to be plucked. Sometimes I scribble a little cartoon of what I have in mind for the piece, sometimes I have a photograph of a scene I want to use, and sometimes the image is just in my mind. Then I turn the kitchen into a dyeing lab for a day of dyeing all the colors and wool I hope to use in the project. I do have a stash of wool from various sources that I go to for accents and drops of color, but the bulk of the wool for each rug I dye for that rug. Then I start the work. Sometimes I draw some guidelines on the linen burlap backing I use, sometimes it’s just blank. Lately it’s just been blank. While working on a rug I am aware that I am creating the rules for the rug, the structure, the order that I will either observe or break. These are my rules, my choices. So with the polypods rug I chose how each of the fungi grew, and the same with the borders, which were based on imagining lichen growing alongside the polypods. A couple of things draw me as I do the rugs. One is that I want to pay attention to the natural world around me and to celebrate it. 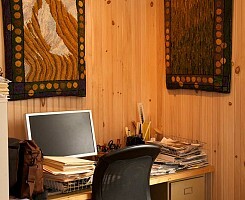 The other is that I want to create rugs that are rugs, for the floor, more than as hangings on the wall. Right now I am fixated on the borders and how they enhance the meaning of a central image in a rug and help with the “rugness” of a piece. 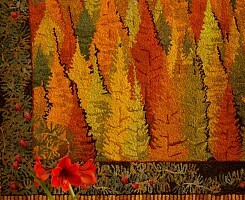 I belong to the Green Mountain Rug Hooking Guild, which regularly has shows of 400-500 rugs each time at the Shelburne Museum in Vermont. “Mosquito Head” and “Low Tide” won Viewers’ Choice awards in 2008; “Larch” won in 2011; and “Look,” in 2012. 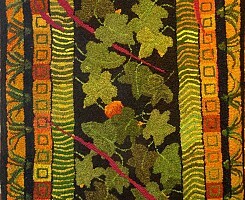 We have a gallery at Hedgerow in Martinsville where my rugs are on display May through November. In terms of educational background, I have an undergraduate degree from NC State University in Environmental Design in Architecture, a Master’s of Landscape Architecture from The University of Michigan and a Master’s of Divinity from Union Theological Seminary.